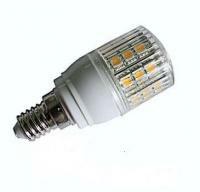 This LED bulb has 27 flat HIGH POWER SMD 5050 leds and is designed for E14 base. Can be used instead of all halogen lamps for 230V. Replaces 50W halogen bulbs and gives the same lightning just with 4W !!! This is a new generation of highly efficient and cheap LED lighting, which are very environmentally friendly and saves both your wallet. Guarantee a long life - up to 40 000 hours. These LED lights can fully replace the traditional light bulbs or a fiber-efficient fluorescent bulbs. All our Led Bulbs COMES WITH 2 YEARS WARRANTY.